Foreign Bodies and Toxins- What should you do? Oh, no! My pet ate something it shouldn’t have! Do you need to keep your garbage and laundry hamper locked tight, lest your pet get into something? Unfortunately, this is such a common issue in the animal world. While some ingestions may be fairly benign, causing mild GI upset, others can be much more severe requiring medical intervention or even surgery. Each year the ASPCA posts the top toxins which they received calls for, with human prescription medications topping the list and over-the-counter medications at a close second! Check out the list from 2016 for more information. Many of these ingestions can require lengthy hospital stays and treatments, with some having much better outcomes than others. What about an animal who eats an object? We have had to perform surgery on many animals to remove foreign objects- usually these will show up on X-Rays, sometimes barium is given to outline the object. A few of the more memorable objects include: clothing (underwear and socks are the dog’s clothing of choice), string (more common in cats, of course, string can actually saw through intestines- very dangerous! ), pieces of foam puzzle mat flooring, rocks, an electrical resistor, branches, condoms, bones, etc., etc. Check out some of the oddest X-Ray winners from 2016! What should I do if I suspect my pet ingested something inappropriate? Call your vet immediately! If it is something that requires the pet to vomit, they’ll need to see your pet as soon as possible, before the object is absorbed into the body, or passes from the stomach into the intestines. Knowing this information will drastically help improve your pet’s care and treatment. They will also want to know information about how your pet was feeling prior to ingesting this item, if they are on any medications, or have any pre-existing conditions they should know about. What if my Vet Recommends Surgery? If your animal ingests something solid which cannot pass through the GI tract and cannot be vomited up as seen on x-rays or Ultrasound, surgery may be the only option. When we open up the abdomen under anesthesia, the entire GI tract is felt between the fingers to find all of the possible locations where the foreign material could be. Many times we have to make multiple cuts into the intestines to rid of foreign materials. Once the material is removed, the areas of the intestines which were cut open are then sutured back together. A ‘Leak test’ is performed, injecting sterile saline into this area of the intestines to ensure the sutures have formed a strong seal from any leaks. Of course, pain medication is given to keep your pet comfortable, and antibiotics are sent home with all pets to try to reduce infection risk from opening the intestinal tract. An Elizabethan collar (cone collar) is sent home with your pet to ensure they don’t bite or lick at the incision. 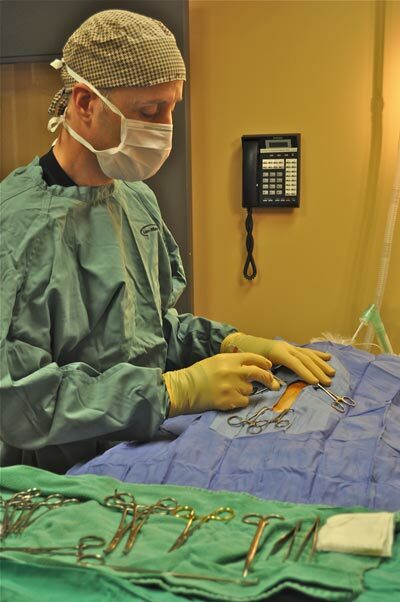 This is a very in depth surgery, and most animals aren’t at their healthiest prior, so these are animals who need to be monitored very thoroughly before, during, and especially after the procedure. With feeding, they need small frequent meals for a few weeks to avoid overloading the intestines and potentially stretching the sections of the intestines with the sutures. Prognosis depends on many factors, your vet will be able to discuss this in more depth with you while looking at each individual case.